The leaves are the photosynthetic organs of a plant. The cells are packed with chloroplasts, which convert CO2 gas from the atmosphere and water to glucose, using the energy of sunlight. The produced glucose is then either respired and used as an energy source, or it is converted to other organic substances needed for plant growth. The cells of a leaf also produce molecular oxygen (O2 gas) as a waste product. This gas is either given off into the atmosphere, or stored inside the leaf for the night, to be used for cell respiration. In order to provide the cells of the leaf with sufficient CO2 and to allow for the escape of O2, the bottom side of the leaves contain countless openings, the stomata. Each stoma can be opened and closed by the expanding and contracting action of two guard cells. The stomata open during the day to allow for the free movement of gases into and out of the leaf. At night, when photosynthesis does not take place, the guard cells close the stomata to minimize the loss of water. Exceptions do exist, such as the CAM (Crassulacean acid metabolism) plants, which grow in hot and dry environments. These plants close the stomata during the day to further reduce the water loss. These plants then open the stomata at night to allow CO2 to enter the leaves. The CO2 is fixed and the product is stored in vacuoles to be used for photosynthesis during day. The stomata and associated guard cells can be made visible in several ways. Thin leaves can be placed directly on the slide for observations. The light intensity must be sufficiently high to pass through the leaf. 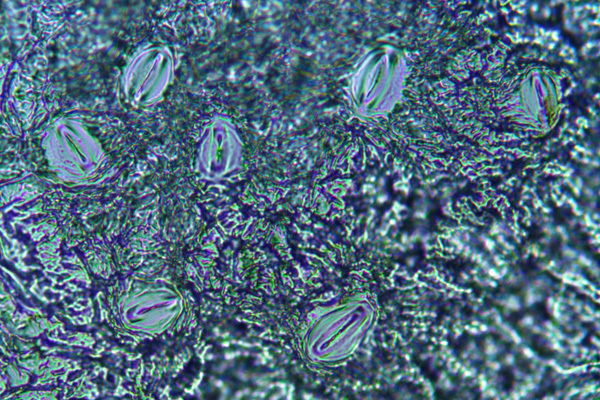 The distinctive shape of the stomata and guard cells can then be seen, but the quality of the image is naturally not high. Carefully microtoming the leaf would be another possibility, but this can become a problem, especially when leaf observation is to be done with students or children, when safety issues start to play a role. Making leaf impressions is probably one of the least complicated and easiest methods to make the surface texture of the leaves visible. 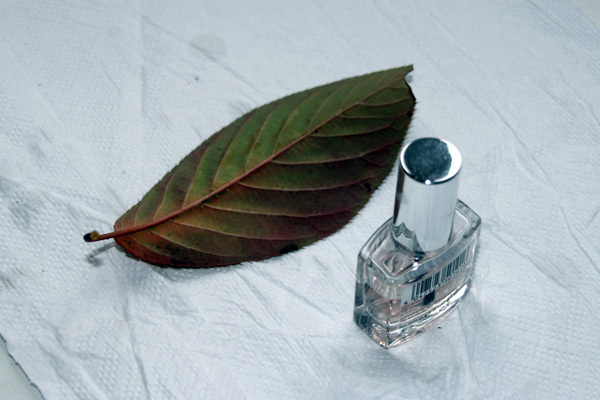 Some glue or clear nail polish is applied to the bottom side of a leaf and allowed to dry completely. One should not apply the glue over the leaf veins, as this makes it more difficult for the glue to be separated after drying. The film is allowed to dry completely (one day) and then carefully peeled off and mounted on a slide for microscopic investigation. It may be necessary to use a sharp object to start peeling away the nail polish, the rest of the dried nail polish should come off quite easily as the waxy cuticle on the surface of the leaves prevents the nail polish adhering to the cells. it goes without saying, that the solvent in the nail polish harms the leaves so that it is advisable to use the fallen leaves from a tree. Alternatively one can use water-based white wood glue, which should be less problematic in this respect. I found out that the white wood glue is more flexible than the nail polish and may deform more during the peeling process. Peeling off the dry nail polish. The thin film of nail polish is then carefully pressed against the glass slide to reduce warping. It is then observed microscopically in the form of a dry mount. 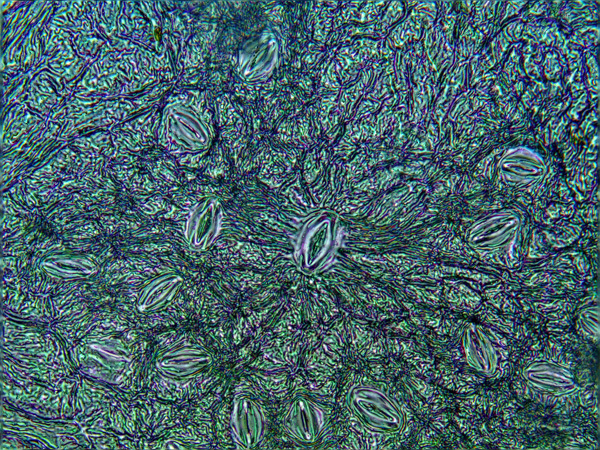 Making leaf impressions, while much easier than trying to cut the leaf into thin sections, does have the disadvantage that individual cell organelles, such as the green chloroplasts in the guard cells, naturally are not visible. Leaf impressions that are obtained this way are, naturally, low in contrast and require you to close the condenser aperture diaphragm. The leaf-impressions are, however, very suitable for observation in oblique illumination. This technique allows light to strike the specimen (i.e. the piece of glue carrying the leaf impression) only from one side, resulting in a characteristic 3-dimensional appearance. The next obvious step would be the making of a permanent mount of the nail polish impressions. This is likely to be difficult, as the organic solvent of mounting media is likely to soften or even dissolve the impression. It is also important that the refractive index of the mounting medium is different from the refractive index of the nail polish impression, otherwise the structures will not be visible. Evidently there are still many opportunities for experimentation. A typical deciduous plant leaf is composed of several layers. 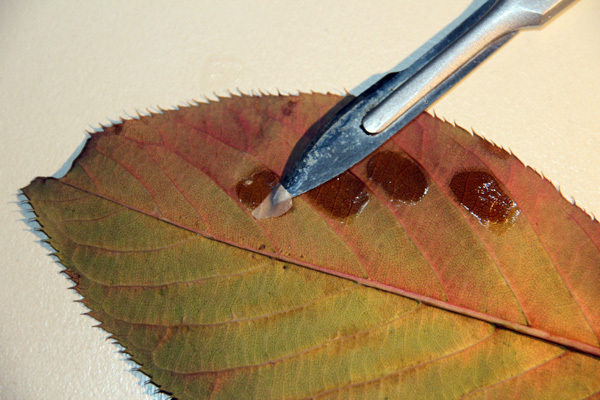 The top most layer of a leaf is a cell-free layer of wax, the cuticle. Its function is to reduce the loss of water from the cells. The waxy cuticle is produced by the upper epidermis. This layer of cells does not contain chloroplasts in order to allow sunlight to pass through unhindered. 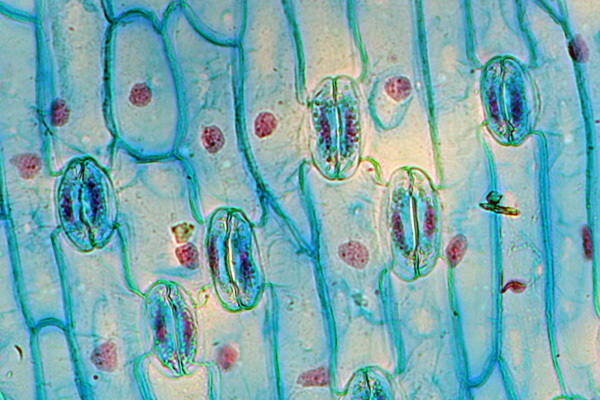 The palisade mesophyll is a layer of packed cells beneath the upper epidermis. The cells are arranged vertically and contain many chloroplasts. Their vertical arrangement and high density makes them an efficient layer for photosynthesis. Spaces between the individual palisade cells allow for the diffusion of CO2 gas. Beneath the palisade mesophyll, one can find the spongy mesophyll. It is a loosely packed layer of cells, containing (as the name “spongy” suggests) many air spaces. This is the place where the gases CO2 and O2 are stored. Many cells are in contact with the air spaces and therefore the total surface area to loose water is also quite high. The lower epidermis is a single layer of cells on the bottom part of the leaf. It is the plant tissue which contains the guard cells and the stomata. With the exception of the guard cells, the lower epidermis is free of chloroplasts. Thank you for all of your wonderful pictures throughout the year.